Last fall I had the opportunity to create original artwork for Imagery Winery in Glen Ellen, CA and bottles are now available. It's delicious, and I’m so happy with how the bottle turned out! Code Blue Wine is 75% Grapes, 25% Blueberries, image Cathy Ellis 2018. Open Mind Art Space is pleased to present its 3rd Annual Anniversary Exhibition, organized by gallery owner and director, Alison Limtavemongkol, and Los Angeles artist and curator Matt Allison. Participating artists will be contributing their work to raise money in support of the American Civil Liberties Union (ACLU). A reception for the benefit will be held tomorrow, Saturday, March 9th from 7:00 PM - 10:00 PM. The exhibition will be on view for a period of two weeks through Saturday, March 23rd, 2019. If you're in Ventura County swing by and check out the new Cole Creativity Center at the Santa Paula Museum of Art, Cast Iron, oil on panel, 2017 (below) is on view in their new space through August 19th, 2018. Save the date, July 5th! I’m excited to be part of POST, Los Angeles July Kamikaze line up with these terrific artists! Curated by Rose Briccetti Reception 7-9pm on Thursday, July 5th, 1206 Maple Ave, #515, Los Angeles, CA. The small piece below is currently on view at SHE-DEN, an intersectional feminist art exhibition at UCSB. The exhibit is organized by Womanhouse Collective at the Red Barn Project Space and has been extended through April 1st. Fantastic to be part of this show that brought together grads, undergrads and faculty from the Department of Art working in a huge range of media! Additional details here, visits by appointment. I'm excited to share a two person show with the ever talented Patrick Gilbert. Personal Effect, new paintings and sculpture is up at Love Gallery, PLNU, San Diego. Runs into early April and is open to the public 9-5 weekdays. My upcoming solo exhibition, Salt Found Me opens this Monday, December 4th with a reception from from 4-6pm. If you're in town it would be wonderful to see you there! ARTLAB, Adams Art Complex, Westmont College, Montecito, CA. Join us at our monthly Gallery Days series. Meet Cathy Ellis, artist for Imagery’s 2015 Malbec, have her sign a bottle and talk about her artwork. This July I spent two weeks at Anderson Ranch in Snowmass, Colorado. I was awarded a small fellowship to participate in a two week Advanced Painting Mentorship Workshop with Enrique Celaya. It was a tremendous experience with a great group of people that will influence my paintings for years to come. Celaya's teaching at the ranch and thoughts on painting have recently been published as On Art and Mindfulness: Notes from the Anderson Ranch. I highly recommend it. Last year artist and Imagery curator Bob Nugent invited me to design a label for the collection at Imagery Winery in Glenn Ellen, CA. I was honored to participate. My work was matched with a 2013 Upper Ridge Malbec. Released this fall, it's amazing. Stop by my studio for a taste or get your own at the link below. Be sure to visit Imagery's gallery and tasting room in person if you're in Glenn Ellen, their collection holds labels by luminaries like Judy Pfaff, Sol LeWitt and Terry Winters, plus hundreds of other artists, famous and obscure. Plus award winning wine, and a permaculture garden. What more could you want? I'm honored to have been invited by Mary Warner to participate! Show runs August 21st to October 2nd. While as a species we begin to say our ‘long goodbye’ to paper, as it becomes a shell of it’s former self, it is healthy to think about what it has been and what it still has to offer. Next month at Tiger Strikes Asteroid, Los Angeles we are holding a party for paper, a get well party. We wish to celebrate the coming rebirth of paper free from it’s mundane role -as receipts, divorce papers, bills and tabloid newspapers. In the spirit of Chinese literati paintings, words and images are practically inseparable. Whether the work is born bathing in mist and clouds among monumental mountains, or under the blinding sun amongst swaying palm trees it is welcome. So, great artists, calligraphers, poets and paper-makers please join us. Courtney Jane Miller Landscape Architecture is sponsoring a summer art series at their Canon Perdido design studio. DROUGHT RESISTANT will feature the works of three women artists who maintain studio practices in Santa Barbara. Each artist will present their work via a solo show for one month during the summer from June to August. The first artist in the series will be Cathy Ellis opening in June. Cathy Ellis is known for her exceptionally competent compositions and dramatic color combinations. Her development of subject matter reveals a thoughtful mind at work in the sloppy sticky edges of memory and mistake. The work lures viewers into it, leaving room for them to fill in the back-story and to build the associations of meaning around the elegant and yet clumpy figures and landscapes. Like a loud rock power ballad, her work makes big noises about quiet subtle reflections. Cathy Ellis received her BFA from Sonoma State University and her MFA from the University of California, Santa Barbara in 2014. She has exhibited nationally, including exhibitions at The Museum of Contemporary Art in Santa Barbara, the Minan Gallery in Los Angeles, Cal State Channel Islands in Camarillo, 186 Carpenter in Providence, RI, the Sonoma Valley Museum in Sonoma, SFMOMA Artist’s Gallery, Trillium Press and Southern Exposure in San Francisco. 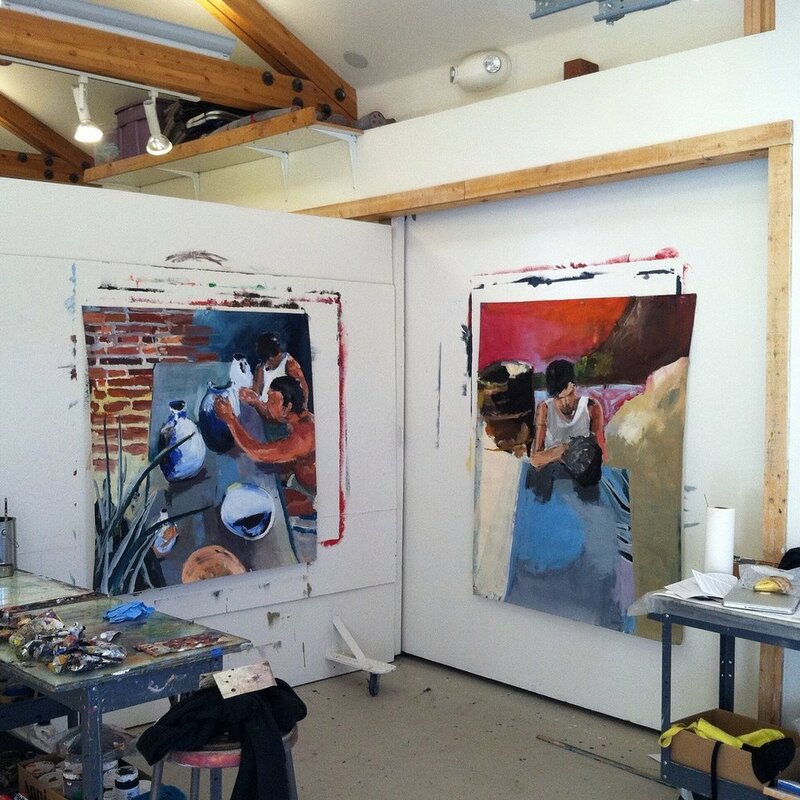 She is currently a Teaching Fellow at the College of Creative Studies, University of California at Santa Barbara, and the 2014 winner of the Howard Fenton Award for Painting. The three artists in Drought Resistant, Cathy Ellis, Megan Mueller, and Jenalee Harmon, are contemporary experts within their individual disciplines and regularly show their work nationally. The series is curated by Patrick Melroy. The idea for DROUGHT RESISTANT came from a creative conversation between CJM::LA principal Courtney Miller and several artists within the community. The substance of the discussion surrounded the desperate need for more quality venues for contemporary art within the very rich cultural center of Santa Barbara. Miller engaged curator Patrick Melroy who in turn invited three artists who have persevered through the shortage of show space and continued to advance their artistic practice despite not having a lot of room to spread out. The title of the series was entirely the idea of artist MeganMueller. I'm honored to have been selected for this years Call for Entries Exhibition at the Museum of Contemporary Art, Santa Barbara. I'll be creating a site specific painting directly on the museum wall over two weeks before the exhibition opens. Cathy Ellis + Megan Mueller: Some Other Time Travel. Some Other Time Travel explores place and architecture as sites for escapism, transformation and unexpected humor. The exhibition is the first in a series that invites students and graduates of the Master of Fine Arts program at UCSB to present their work at CI’s Napa Hall Gallery, allowing an exchange of expertise and exhibition space between the two institutions. The collaboration also fosters mentoring relationships between UCSB graduates and CI undergraduates interested in pursuing careers in the fine arts.